Learn to experience a rich life of spiritual wellbeing in a world, post-technology. A Revelation of Your Innate Gifts and a Spiritual Guide to the Good Life. The Chayim Tovim is a guide and exploration into attaining the Good Life. Many people have experienced the steps outlined in this Sefer, achieving their personal Chayim Tovim. The Chaim Tovim book and seminars have totally changed my life. They have helped me begin to sincerely understand who I and G-d really are. Questions that I would often dismiss as trivial but with a few secluded, quiet, reflective moments I anxiously sought to answer, have now begun to enlighten me. What is my purpose in life? What does G-d really think of me? What do I honestly aspire to and desire? What is my true relationship with the Almighty? How can I live happy and worry-less? Although these life-altering sentiments can be overwhelming, the Chaim Tovim has managed to smoothly guide me to a life of genuine happiness and purpose. These lessons have and continue to, enrich my life and my family both physically and spiritually. Read and review the book and seminars and watch your life transform! The teachings of The Chayim Tovim were the keys to learning about and unlocking my inner qualities, natural gifts and true essence. They brought me to a clear understanding of how sweet being a Yid really is, and about the inner peace that lies within. Until this very day, these teachings help me develop further, as a person, husband, father, and businessman. The Chayim Tovim book and what it teaches has changed my life in ways unbound by words. As a young professional living in the tri-state area who grew up frum seemingly having it all, yet still searching for more led me to the Chaim Tovim were I was able to taste this world of yeeshuv hadaas - peace of mind. It has brought me to the truth of how to experience “the good life”. 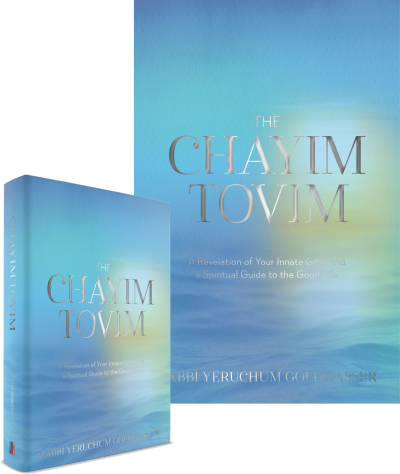 The expansive light and wisdom disseminated throughout the teachings of the chayim tovim has transformed my life in all areas and I’m sure it will for yours as well. The teaching of the Chayim Tovim helps me navigate through life's trying moments and have empowered me with the ability to appreciate the subtleties and true pleasures of life. I have learned of the delight and gratification of what a transparent relationship with Hashem has to offer and how each person is entitled to this opportunity. The special tools and steps learned in each seminar really built me to live life to full capacity. Tzama Nafshi is an international Kehilla that began at the turn of the new millennium. It's comprised of Balei Batim, Yungerleit, and Bochurim who embody the Kehilla's mehaleich of a seamless blend of niglas hatorah and pneemiyus hatorah. Copyright 2018 Chayim Tovim © All rights reserved.